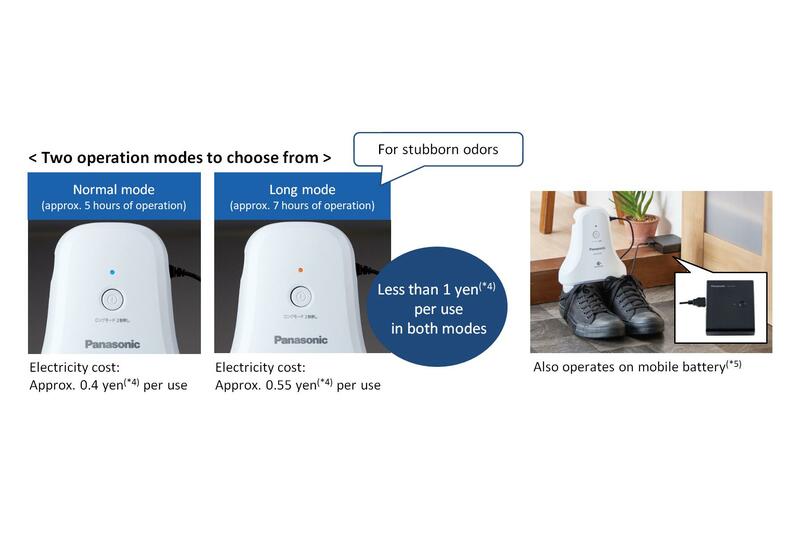 Osaka, Japan - Panasonic Corporation will begin selling a shoe deodorizer, the MS-DS100, equipped with "nanoe X" that generates 10 times(*2) more hydroxyl (OH) radicals than "nanoe" to remove unpleasant shoe odors in a simple way, on September 20, 2018 (in Japan only). One of the common causes of unpleasant shoe odors is isovaleric acid, an odorous substance produced by foot sweat and bacteria. 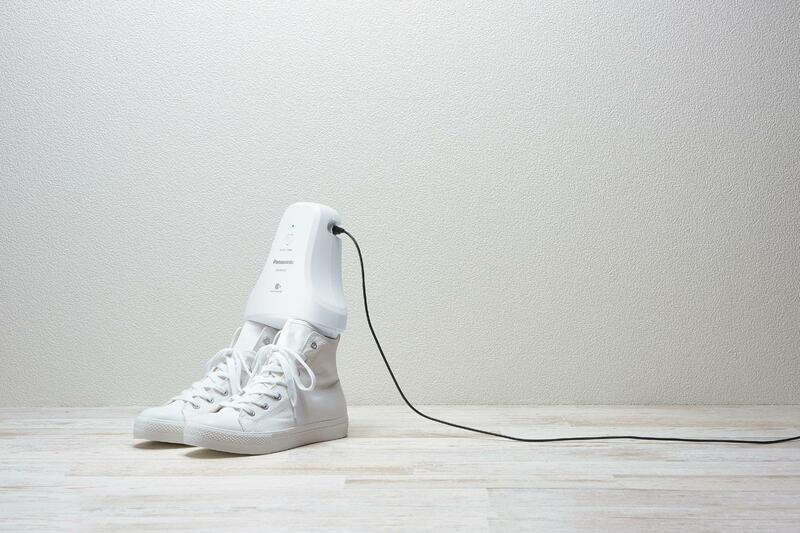 According to a survey(*3) Panasonic conducted with sneaker wearers, about 62% of those surveyed take some measures to remove shoe odors, but about half of them are not satisfied with the deodorizing methods they use. 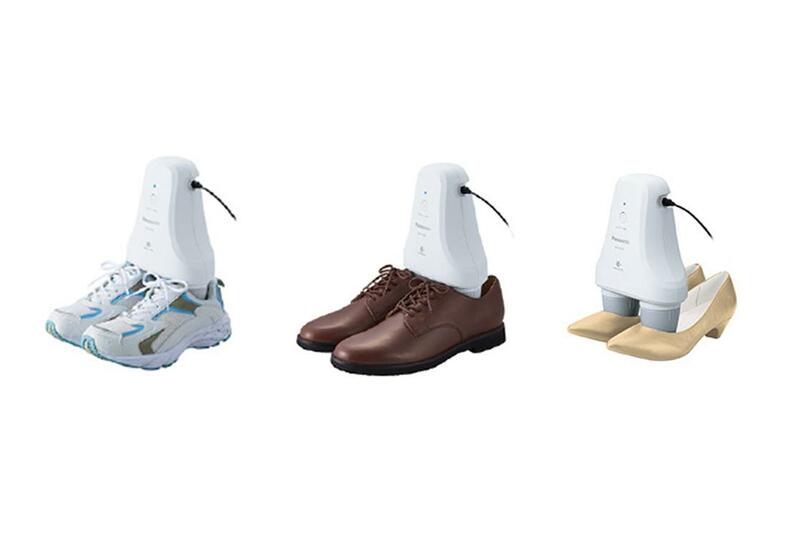 The MS-DS100 utilizes Panasonic's original ion particles, "nanoe X," to dissolve and eliminate unpleasant shoe odors(*1). 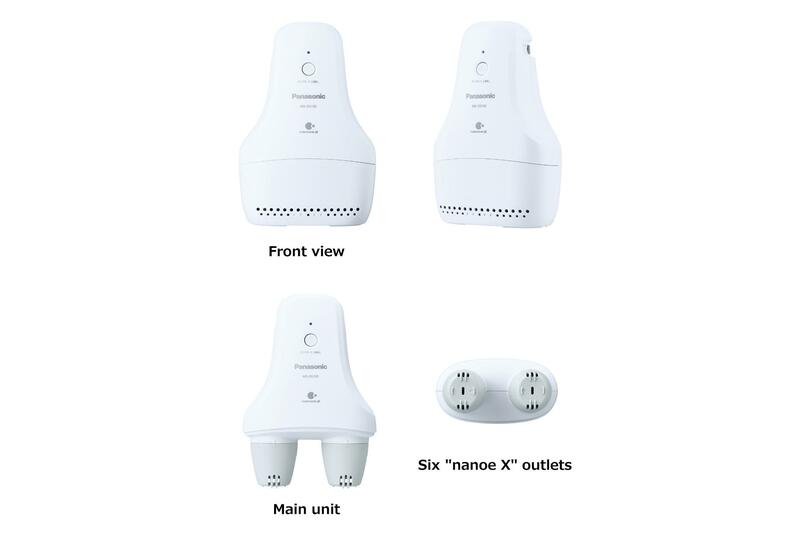 When the product is set in shoes and the switch turned on, "nanoe X" is generated and spreads from six outlets to every corner of the shoes to remove odors(*1) in the entire interior of the shoes from the heel to the toe. There are two operation modes to choose from. The normal mode provides approximately five hours of operation, while the long mode runs for about seven hours to remove stubborn odors. Both modes cost less than 1 yen(*4) per use, so it is very economical. The MS-DS100 also operates on a mobile battery(*5) so it can be used at a place where there is no AC power outlet. The product comes with a stylish storage case. The case accommodates the cap sections that are inserted into shoes for use, so the product can be stored neatly in the entrance area or shoe cupboard. 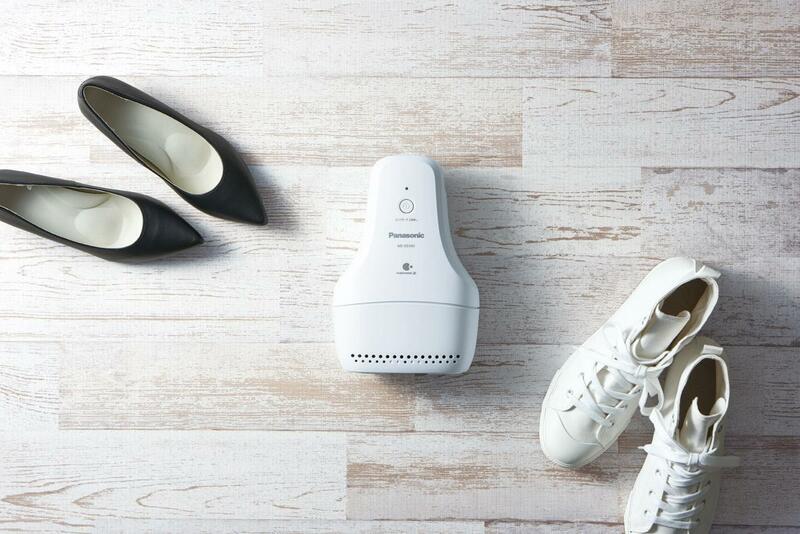 With the MS-DS100 shoe deodorizer, Panasonic proposes an easy way to remove shoe odors and expects to create new market demand. The MS-DS100 utilizes Panasonic's original nano-sized ions, "nanoe X." 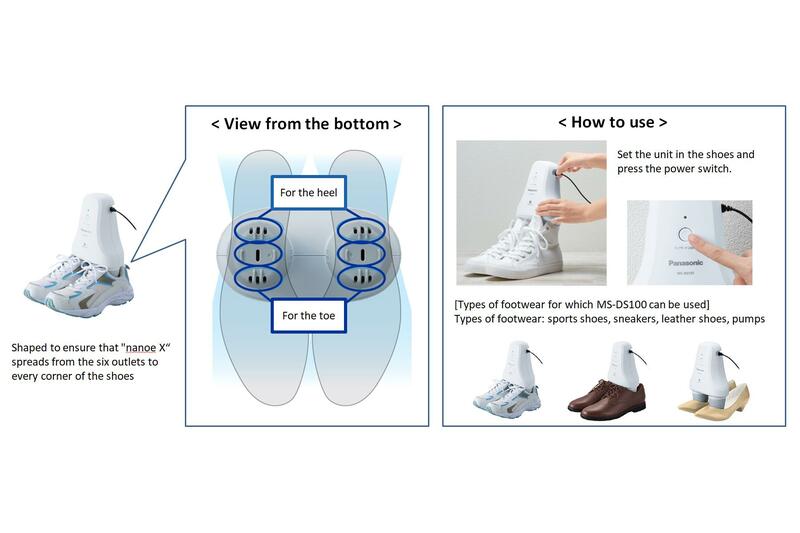 Measuring about 5 to 20 nm each, the "nanoe X" particles penetrate the textile and dissolve and eliminate unpleasant shoe odors(*1).The six outlets discharge and spread "nanoe X" to every corner of the shoes to provide a thorough deodorizing effect. Economical operation with electricity cost of less than 1 yen(*4) per use. Also operates on a mobile battery(*5). There are two operation modes to choose from. The normal mode provides approximately five hours of operation, while the long mode runs for about seven hours to remove stubborn odors. Both modes cost less than 1 yen(*4) per use, so it is very economical. The MS-DS100 also operates on a mobile battery(*5) so it can be used at a place where there is no AC power outlet, such as in the entrance area or shoe cupboard. Storage case provided with the product features a stylish design to look attractive when placed in an entrance area. The storage case provided with the product accommodates the cap sections that are inserted into shoes for use, so the product can be stored neatly. 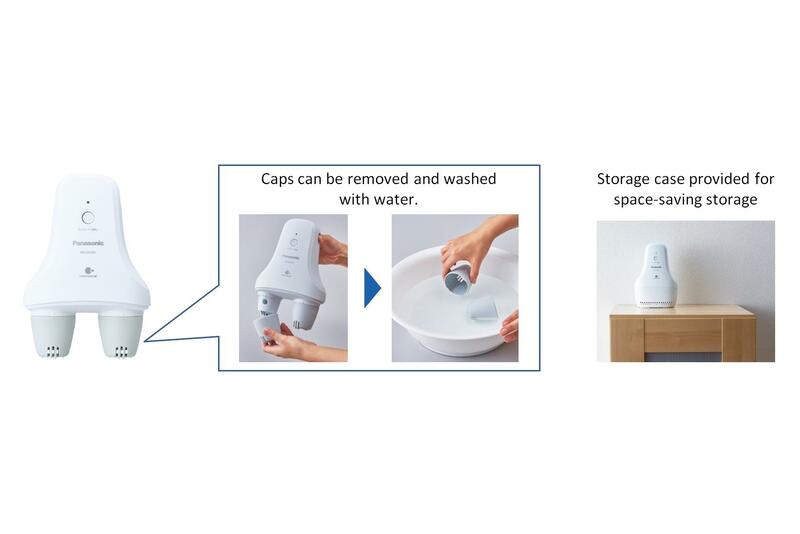 The caps with antibacterial treatment(*6) can be removed and washed with water, so they can be used hygienically. *1: Effect of deodorizing foot odors (isovaleric acid) adhered to shoes. Testing laboratory: Panasonic Corporation, Product Analysis Center. Testing method: 6-stage odor intensity measurement method in an about 10-m2 test room. 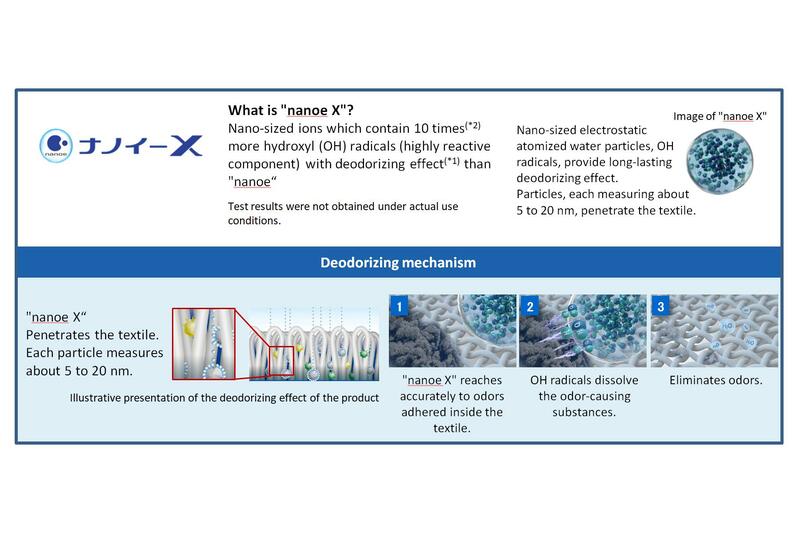 Deodorizing method: Generation of "nanoe." Test result: Odor intensity decreased by 1.5 in 5 hours. Test result certificate issuing date: June 4, 2018. Test result certificate number: 1V332-180604-K01. - Test results were not obtained under actual use conditions. - Deodorizing effect varies depending on the ambient conditions (temperature, humidity), operating time, type of odor, and type of textile. - Sensitivity to the deodorizing effect may vary from individual to individual. 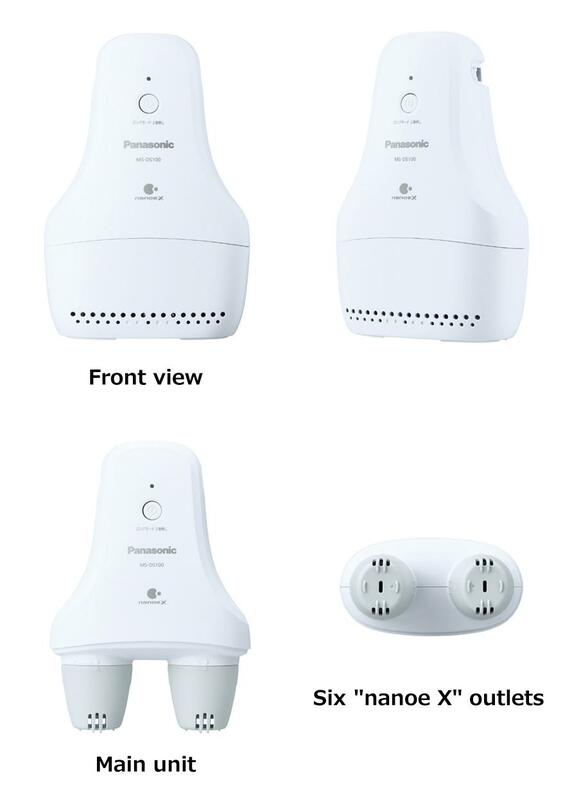 *2: According to the results of Panasonic's measurement conducted based on the ESR method. Comparison between 480 billion "nanoe" particles/second and 4,800 billion "nanoe X" particles/second. *5: For normal mode, use a mobile battery with a capacity of 3,760 mAh or more (rated output: 5.0 VDC, 1.8 A). For long mode, use a mobile battery with a capacity of 5,000 mAh or more (rated output: 5.0 VDC, 1.8 A). Operation on a mobile battery cannot be guaranteed since the operating time may differ depending on the usage conditions, environment and other factors. - Mobile battery is not supplied with the product. *6: Antibacterial effect. Part name: Cap. Antibacterial effect verifying laboratory: Japan Food Research Laboratories. Testing method: In accordance with JIS Z 2801. Test result: Antibacterial activity value of 2.0 or higher. Antibacterial method: Antibacterial agent contained in the resin. Name of the part with antibacterial treatment: Antibacterial treated resin. Test result certificate issuing date: August 25, 2015. Test result certificate number: No. 15083195001-0101.